Roubo’s great multivolume L’Art du Menuisier. Click on the image to see a larger version If you look on the back of a nickel, below the dome on Monticello you’ll see a pediment with an arched window. This window is in the little attic room where Thomas Jefferson kept his woodworking bench. Here, Jefferson could chisel and plane, pausing now and then to sweep the shavings off of his leather-bound volumes of André Roubo’s L’Art du Menuisier — The Art of the Joiner. The dome on Monticello was a Roubo contribution as well — not from his books, but from one of his actual buildings. During a visit to France, Jefferson was inspired to rapturous verse by André Roubo’s great wood-and-glass dome spanning the courtyard of the Paris wheat exchange. Under this dome, Jefferson met his lady-love Maria Cosway, and on his return to Virginia, he modeled the dome at Monticello after Roubo’s creation. So whatever else we owe him, without André-Jacob Roubo, the back of our American nickel might be blank. Roubo was the real thing. The son of an impoverished cabinetmaker, he was indentured at age twelve, in 1751, as a heavy construction laborer. In spite of this hard start, he somehow managed to impress Jacques-François Blondel, writer, teacher, and architect for Louis XV. Studies with Blondel gave voice to Roubo’s mechanical genius. In 1769 the Académie des Sciences published Roubo’s great multivolume L’Art du Menuisier, from which I translate his plan for a tap and screw box — tareau et filière en bois (part 3, section 3, chapter 13, plate 311). If joiners had mandrel lathes (or rather, if they could afford them), they wouldn’t need screw boxes and taps. But, when they need to make items that can be disassembled (and they must avoid expensive ironwork), then they must have some way to make wooden screws and nuts. There are taps and, therefore, screwboxes of all sizes, from 1/4 inch in diameter, right up to an inch, and even above. You may buy them ready-made at the Marchands Clincaillers; however, it is quite easy for joiners to make them. Make the tap first. The tap shown in figure 4 is a tool of steel with a wooden handle in the same form as an auger. The lower part of the tool is cut in the form of a screw. The threads project from the hub of the body and are interrupted by four file cuts parallel to the axis of the tap. Figure 2 represents the four projecting angles, which are all perpendicular to the center a. When the tap is used, these flats across the screw threads act as cutters to slice and carry away any wood they encounter. Draw on a piece of paper a parallelogram, U, X, Y, Z, figure 1, of which the width is equal to the circumference of the tap. Divide this width into six equal parts, as the perpendicular lines of this figure indicate; then take half of one of these divisions which you carry from Z to d, which gives the inclination of the steps of the screw, which, to be good, must be 1/12 of the circumference. As to the pitch (the distance from one screw step to the other), it must not be greater than the distance d-Z, that is to say, 1/12 the circumference of the screw, or 1/18 at the least — especially for wooden screws. When you have drawn the line of one screw step (Y-d), add as many parallel oblique lines as you want to make screw-steps on the tap. This being done, glue the paper around the lower part of the tap, observing that the horizontal lines meet perfectly. When the glue is dry, take a triangular file and cut the spaces between each oblique line around the circumference of the tap, right up to the threads indicated by these lines, coming to a sharp edge. If performed right, it is certain that you will succeed to make taps of all sorts of thicknesses as perfect as they can be — without being made on the lathe or with the iron-cutting die. When you want to use the tap, bore a hole equal in diameter to the tap at the bottom of the screw threads. Put the tap in this hole and turn it from left to right, taking care to withdraw it and lubricate it from time to time. This prevents the wood from jamming and the thread from splitting. The pressure of the tap may even split the piece, which you can avoid by keeping the piece in a vise as you work. To get it started, it helps if the tap is a little smaller at the bottom. Figure 3 shows a cut-away view of a tap that is halfway through a piece of wood. Having made the tap, it is very easy to make the screw box. This must be made with very dry, hard wood such as boxwood, service tree (Pyrus sorbus), etc. 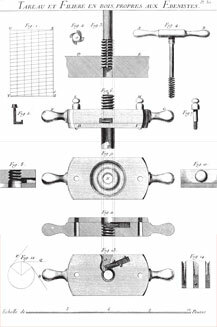 The screw box is composed of two main parts; the first of these is the die, which is a piece of wood about an inch thick, three inches wide, and nine or ten inches long, including the two handles F, G. On this die is the second part, a piece of wood H, I, figure 6, about 3/8 inches thick called the guide plate, which is fastened to the die with two screws L, M, which pass through the die and thread into the guide plate as in figures 7 and 11. Bore a hole N, figure 9, in the middle of the die and thread it with the tap as in figure 3. This makes the inside of this hole a nut, with which, along with the V-cutter placed inside the die, one can make wooden screws, as I will explain hereafter. This V-cutter, shown in figure 14, must be a bit thicker than the height of one of the threads of the screw. The inside of this cutter must be filed out and sharpened keenly at its tip, so that it can cut the wood and not compress it, which will happen, of course, if it jams like the tap. Very often the wood, especially soft wood, compresses instead of being cut, and the threads break. The edges of the V-cutter must not be made perpendicular to its face, but rather a little inclined ahead of b, figure 13, so that it doesn’t cut the wood squarely, but a little obliquely, beginning with the outside of the cylinder in which one wants to make a thread. This facilitates the evacuation of shavings, and at the same time, prevents the wood from chipping, seeing that the extremity of the threads is always cut first. The cutter must be laid out so that its cut, taken on the line of a, b, figure13 (which is one of the radii of the circle that forms the threads of the nut), forms at its exterior an equilateral triangle, of which the apex is at point b. The V-cutter of the screw box is set in a mortise made in the thickness of the die, with care taken that its point b, figure 13, precisely touches the interior circle of the thread and aligns with the internal thread projecting to this same point, as seen in figure 11. This is very easy to do, since it is only a question of making the groove in which the cutter is placed a little more or less deep. Whether the cutter is inclined as in figure 13 or parallel with the side of the die makes no difference, provided that it is always tangential with the inner circle of the threads, that is to say, that the length of the cutter is perpendicular with the radius of the circle taken at its meeting point, as I have expressed in figure 12, where the lines P, Q, R form right angles with a radius of the circle, to which these lines are tangents. The cutter must be placed very accurately and strongly supported in its mortise — as much on its width as its depth, and especially at its extremity c, figure 13, so that when it is used, it cannot push back, however strong be the pressure of the wood of the screw. The V-cutter can be fastened with two or three screws placed on the two sides, as in figure 13. It is even better to put a hook like that shown in figure 5, which passes through the thickness of the die and is fastened with a nut to clasp the cutter in its width. You might even make a groove on the thickness of the cutter in which the hook can fit, just to fasten it in a firm and solid manner. Behind the cutter, with respect to its cutting edge, make a groove, O, figure 13, called the window, which serves as the exit for the shavings. This window must be of a depth equal to that of the groove where the iron is placed, of which it serves as a continuation. The guide plate of the die is bored with a hole, the center of which must exactly correspond with that of the die, and the diameter of which must be equal to the bottom of the threads of the latter, as can be seen in figure 11. The first wooden screw threads in the die are removed right up to the point of the cutter so that it can catch the cylinder being fed into it by the guide plate. After the guide plate is centered and fastened by the screws L, M, finish the screw box on the outside. This finishing will bear no sort of difficulty, seeing that neither the outer form nor the ornamentation of the screw box adds anything to the excellence of these tools. The guide plate keeps the cylinder in place as it is threaded, which is done in the following manner. Begin at first by turning a cylinder of suitable length and size, which you narrow a bit at its end to give it entry. This being done, put the cylinder in a vise and fit the end of the cylinder in the guide plate of the screw box. Hold the screw box in two hands by the handles F, G, and turn from left to right, pressing lightly down until there are several threads made, which are engaged by those of the die, dispensing with the need for any more pressing. On longer screws, be sure to take off the die from time to time and rub the inside with a piece of soap — more to prevent it from getting too warm from the rubbing of the screw than to facilitate its passage. Figure 6 shows a die all put together and seen from the side of the window, with a cylinder S-T, of which the top part is threaded as I have just described. When it happens that the piece that you are threading comes up to a shoulder, work as close to it as you can, then remove the guide plate from the screw box. Then thread again as far as possible, so that there remains no more than one turn to reach the shoulder. Finish this thread with a chisel, so that the screw is perfect in its length. The screw box and tap described by Roubo require some metal working, including annealing, filing, hardening, and tempering. The tap has many teeth and will hold up even if made from unhardened mild steel. The V-cutter of the screw box, however, must be hardened tool steel to hold a keen edge. Old files are time-honored sources for tool steel, and a new file works just as well to make the V-cutters. Just shop around for cheap, imported square ones, likely made of old-fashioned carbon steel. Files are too hard to cut and shape until you soften them. Anneal the file by heating it cherry red and letting it cool very, very slowly. You can now cut off a length with a hacksaw and shape the V with a triangular file. Re-harden the shaped steel by again heating it to cherry red and plunging it into water. This makes the steel so brittle it can snap, but tempering will bring back some of the toughness. Polish the face of the V-cutter on a whetstone so you can see the oxidation colors as you reheat the steel. Slowly heat the end of the cutter away from edge until the polished surface turns straw yellow and then quickly plunge it into water again. Hone the tempered tool to a fine edge with triangular slip stones.